New! Buy "Cool Stuff Products at our "Cool Stuff Store"! Click here for details. Every once in a while, our employees come across “cool stuff.” We run one of our employees' discoveries in every TimePilot Times newsletter. These are our most recent items; to see "Cool Stuff" from our first 40 newsletters, click here. $129.99 with free shipping at TimePilot's new "Cool Stuff Store." Click here to visit the store. The 2-inch-high high-contrast numbers—black on a while background—are printed on plastic cards that flip as the minutes and hours change, just like the clocks and message boards in old-time train stations and airports. $64.99 with free shipping at TimePilot's new "Cool Stuff Store." Click here to visit the store. 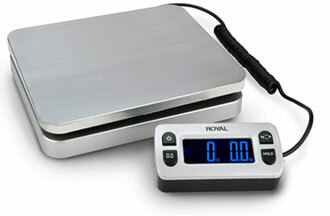 Tare function memorizes weight of box or envelope so you can determine weight of contents. $52.99 with free shipping at TimePilot's new "Cool Stuff Store." Click here to visit the store. Car won't start? Phone out of power? It can take hours for someone to come along and give you a jump-start, even if you have the cables. 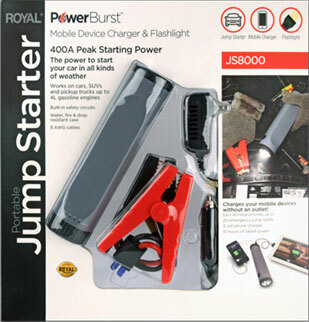 Royal's PowerBurst jump starter has a powerful battery in its flashlight that can provide the power for up to 20 jump starts. It can also charge your cell phone or tablet for up to 10 hours. Cool Store Exclusive: We're including a free zippered pouch to carry the entire system and keep your trunk neat.And we're adding free shipping! The 27,750 mWh jump starter provides up to 400-amp peak power output to start cars, SUVs and trucks with up to a four-liter engine. Includes jump starter, AC and vehicle chargers, USB charging cable and zippered pouch. 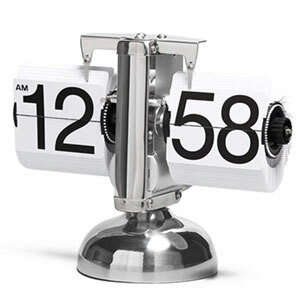 $72.99 with free shipping at TimePilot's new "Cool Stuff Store." Click here to visit the store. Translate many different currencies into other currencies (and if you have an internet connection, it uses live exchange rates!). Convert volume, length, weight and mass, temperature, speed and area from U.S. values to their metric equivalents. Christmas gift for the family traveler? This is a map of the world with a coating over every country and U.S. state. 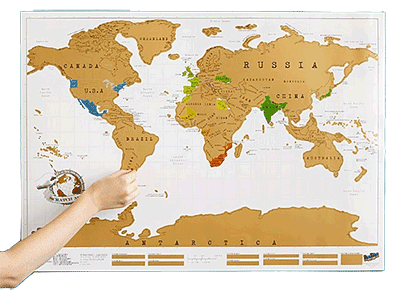 Trace your travels by scratching off the coating when you visit a particular country or state. The coating scratches off with the edge of a coin. Its $26 for the standard size (23.4" H x 32.5" W) and $40 for the large version (33" H x 46.8" W). It never hurts to have a little extra power. 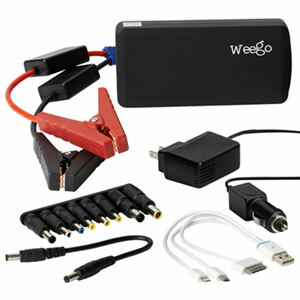 The pocket-sized Weego Jump Starter Battery+ is a powerful battery that can jump-start your car, boat or motorcycle as well as recharge your smartphone, laptop or tablet. It's also got a built-in LED flashlight with strobe and SOS capabilities. It's perfect for the car: the set comes with jumper cables, USB and phone connectors and eight popular PC-based laptop/device connectors. Just throw it in the glove compartment and you'll be ready for emergencies—when stored it loses only 5% of its power per month. The complete set is on sale for $99. Let’s say you find a beautiful piece of furniture at an estate sale 15 miles from home. The furniture is too big to fit in your car, and you’d have a hard time lifting it by yourself anyway. What do you do? Call Dolly. It’s the “Uber” of hauling. Dolly contractors—truck owners—will go get the furniture, haul it to your house and bring it inside for a low price. You set up the appointment and pay for it in Dolly’s smartphone app. They’ll also remove junk or bring items to a donation center, and even just provide two strong people to move furniture or appliances in your house. Here’s how it worked for some friends of TimePilot: This couple lives in Chicago and ordered a chair from a furniture store across the city. 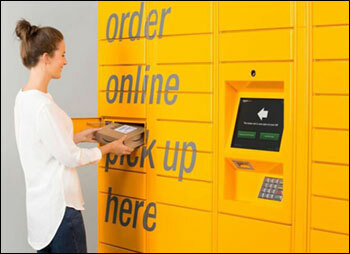 Being city dwellers, they don’t own a car or truck, and they were reluctant to pay the store the $100 delivery fee it charges. They pulled up the Dolly app on their smartphone, and in minutes had reserved two men and a truck. The Dolly men picked up the chair at the furniture store and delivered it. The whole process took less than an hour and cost $50. Dolly is available now in four cities—Chicago, Denver, San Diego and Seattle—and their surrounding suburbs, and has more coming soon. 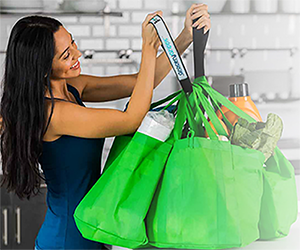 When you go grocery shopping, do you ever have trouble carrying all of those plastic bags? Grocery Gripps make it easy. It's a heavy-duty nylon strap with two loops that lets you carry four, six or even eight bags easily with one hand. 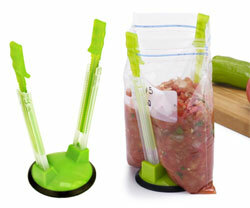 Just run the strap through the bag handles and lift. You can even carry them over your shoulder, Santa Claus-style. They'll carry other awkward things like dry cleaning or even beach chairs, too. Adult coloring books have become very popular in the last few years, and here's one of the most creative and fun ones. Yes, Querkles is a coloring book, but New Zealand artist Thomas Pavitte has taken 20 of the world's great masterpieces and turned them into color-by-numbers artworks. Pavitte's genius idea is that he has disguised each piece of artwork with a mass of circles, so that you won't know what picture you're working on until you're well into it. Pictures have numbers between 1 and 5, along with blank circles. You are not given the colors to use, but choose your own five colors, with 1 being the darkest and 5 the lightest. Not big on coloring? How about dot-to-dot? Pavitte has a series of beautiful, creative dot-to-dot books, too. 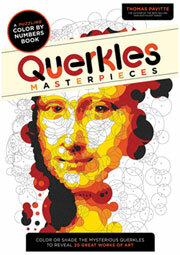 Querkles Masterpieces is available on Amazon for $10.24. If you've ever been to beach, you know one of the worst things is getting sand in your drink or on your food. Or you have an ice-cold can of whatever, and a minute after setting it down in the hot sand, it's warm. Here's the solution—just in time for beach season: Sandstand. 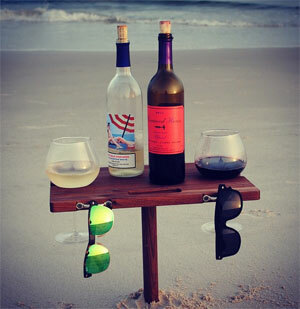 It's a wooden tabletop platform attached to a post that keeps your drinks, food, sunglasses, etc., out of the sand. Sandstand comes in walnut, hard maple or cherry. The top includes sunglass loops, beverage holders and a handle; on the underside are bottle openers, a threaded base for the post, and storage clips for the post when it's not being used. It's easy to carry, simple to set up and does what it's supposed to do. Starts at $75. 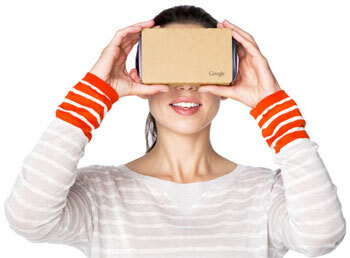 You assemble the cardboard viewer, download a VR app to your smartphone and place the phone inside the viewer. Looking through the lenses in the viewer, it's like you're really there. You can look left, right, up and down, and see things. There are games, documentaries (the New York Times has made a bunch of them) and music apps. You can stand on the stage while the White Stripes are playing, fly over New York City, ride a roller coaster, test drive a Volvo or play a great Star Wars game. Make sure you use your headphones—sound makes it seem even more real. If you've got a smartphone, you probably have a map app. One of the coolest uses for the app is to check traffic when you're traveling. If you use Google Maps (the iPhone or Android app or the PC version) you can turn on traffic reports by tapping (or clicking) the menu icon in the top left corner of the screen and choosing "Traffic." Now on your maps you'll see live reports: red where there's stopped traffic, yellow where it's slowed and icons indicating the cause: construction, accident, etc. We've found it to be amazingly accurate: Recently one of our employees was able to avoid a 5-mile highway backup in the middle of nowhere simply by looking at his phone. To turn off the traffic report, tap the menu icon again and tap "Traffic." If you use Apple Maps, follow the instructions above to turn on traffic reports; the maps will appear a little different, but they're equally effective. Did you ever drive off with your garage door open? Or after a half-hour wonder if you had closed the door? Chamberlain, a major garage door manufacturer, offers a kit that will allow you to see on your smartphone whether your garage door is open or closed. And you can close it or open it with a tap on your phone. Many of their newer openers have this built in, but if yours doesn't, you'll need the kit. It's $93.74 at Amazon. Microsoft blogger Eric Ligman is giving away millions of free eBooks on Microsoft programs. Among them are quick start guides for Microsoft Word 2013, Excel 2013, Outlook 2013 and Access 2013. There are tons of other free books, too: everything from Office programs shortcuts to an intro to Windows 10 to networking to programming for Windows and Windows Phones. Visit Ligman's blog for more. How about a quick intro to Windows 10? It's right here. Your organization's web site is pretty important, right? Is it up and running right now? Or has it been down for the last half-hour without your knowledge? DownNotifier.com is a simple, free tool that alerts you when your web site goes down. Here's how it works: Every 5 minutes, DownNotifier.com tries to access your site. If it can access the site, all's well; if not, it send you an email or text message notifying you. If your site is down, it keeps trying every 5 minutes; when it comes back up, it emails or texts you again. That's it: simple and unobtrusive. Signup is a breeze, and DownNotifier doesn't show up in your web site's hit totals. There's also a premium version. For $14.95 per year, your site will be monitored every minute (instead of every 5) and you get more detail in your reports. We've used it for years and like it very much. To see "Cool Stuff" from our first 20 newsletters, click here.